Rome attraction-guides.com - Rome, Italy attractions guide Rome Trevi Fountain (Fontana di Trevi) information about attractions, open hours, admission charges, history, tossing coins into the fountain, sea horses and marble centrepiece, location and address, general tourist information about Trevi Fountain (Fontana di Trevi) in Rome (Roma) area, Italy (Italia) IT - Last updated 30/10/2012. Rome's Trevi Fountain (Fontana di Trevi) is without doubt one of the most imposing and stunning attractions in the whole of Rome. Every day the Trevi Fountain (Fontana di Trevi) is visited by large crowds of people, many tossing coins into the water. As a result, the Trevi Fountain (Fontana di Trevi) grosses a considerable amount of money each year, most of which is donated to charities in Rome and Italy. In 1730, Rome's Pope Clemente XII decided to replace the existing fountain, which was designed in 1453, with a much more impressive and imposing fountain. 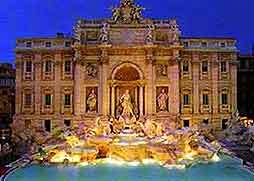 Many of Rome's most prominent artists of that time were asked to assist help him with the Trevi Fountain project. The resulting Trevi Fountain (Fontana di Trevi) is one of undeniable splendour and stature. Featuring a carved, marble centrepiece of a large shell pulled by two sea-horses and driven by two tritons, from which a grand statue representing the ocean emerges, the Trevi Fountain (Fontana di Trevi) has become one of Rome's most famous fountains. Every day, the water is turned off in the early hours of the morning and occasionally at other times so that the Trevi Fountain (Fontana di Trevi) can be cleaned, so if the fountain is empty when you arrive, make sure that you return to see it when it is in full flow.